When I think about Venice the artist who comes to mind first is Sophie Calle; two of her most intriguing projects – Suite Vénetienne and The Hotel – were made there. Both bodies of work fascinate me but it’s The Hotel that makes me feel the most uneasy. I’m pretty sure no-one’s ever likely to stalk me to make art, which is the basis of Suite Vénetienne, but it seems entirely possible that a curious chambermaid might go through my stuff, albeit probably not with quite the same determination as Calle. Making up hotel rooms must be pretty boring work, why wouldn’t you amuse yourself by looking through whatever’s left on show? 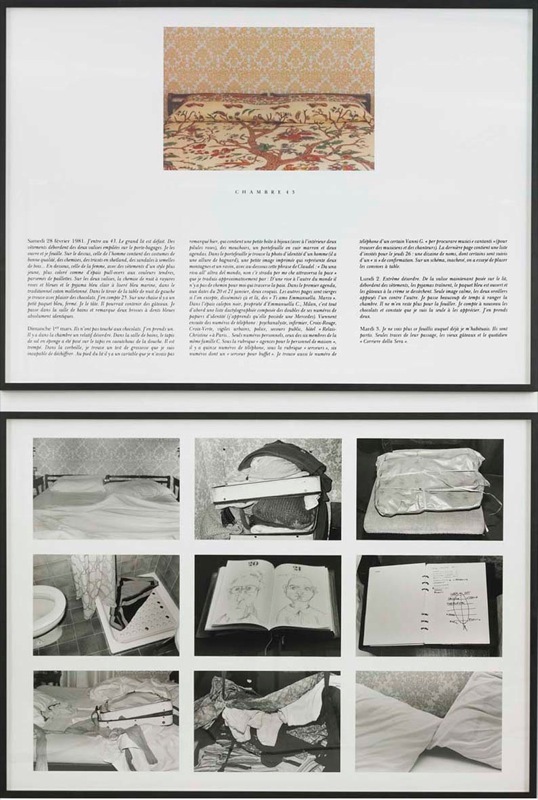 So the basis of the work: in 1981 Sophie Calle took a job in a Venice hotel. 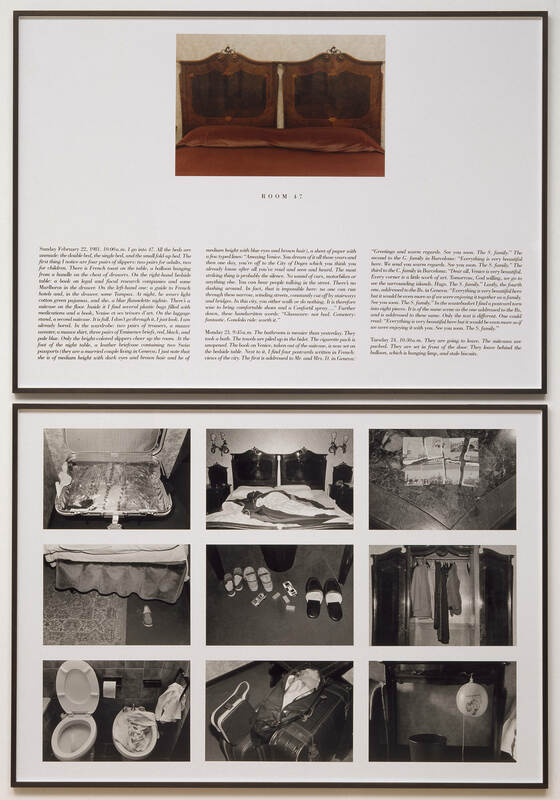 She worked as a chambermaid for three weeks and in that time documented the way she found the rooms each day recording – photographically and in writing – how the occupants had left the rooms and the contents of their luggage. So far, so stalky. What makes the work so extraordinary is Calle’s obsessiveness. She is thorough. Very thorough. Just not in the way one would normally hope from someone in that job. The photographs of the rooms made ready for guests and of the way she found them when going in to clean them – and rifle through the occupants’ belongings – are fascinating in the way that looking through other people’s stuff generally is (it’s just that politeness dictates that we normally limit ourselves to glancing at the shelves of people we visit to see what books they read, what films they watch or what music they listen to). Here we get to see quite how other people behave and it’s not pretty. Calle’s text, which accompanies the photographs suggests a forensically systematic approach: she has read postcards and diaries left out, opened suitcases, recorded the contents of the bin etc and made detailed not in everything she’s found. In many ways, as with most of Calle’s work, The Hotel says more about the artist than it does about the unwitting subjects. But for all the same reasons that I love the work, I’d hate to see it in a gallery and recognise myself. Indeed it’s entirely possible I’m a tidier hotel guest just for knowing this work exists. This entry was posted in Performance, Photography and tagged art, Hotel, L'Hotel, photography, Sophie Calle, Venice by Ann Jones. Bookmark the permalink.